North Lamar’s UIL Literary Criticism Team earned first place at the Mt Pleasant UIL Academic Meet on Saturday. 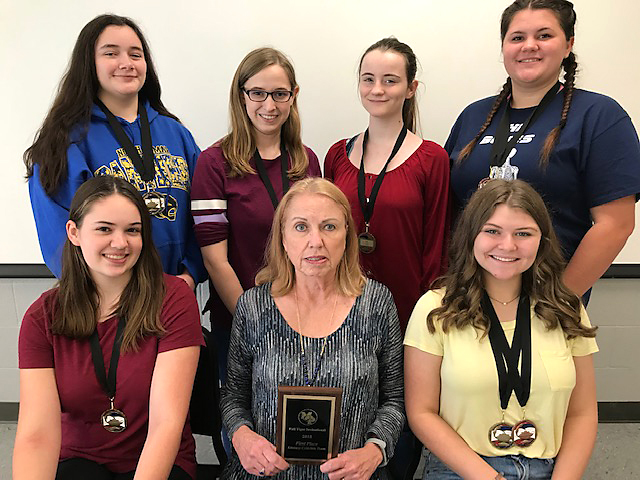 Coached by Dr. Linda Winfrey, front center, are Katie Conlin and Teagan Holley in front, and Autumn Flick, Riley Cregg, Allison Wood and Kareagin Allison in back. The Literary Criticism Contest requires knowledge of literary history and of critical terms and ability in literary criticism. Students are required to select the best answers involving judgment in literary criticism and to analyze literary passages from both the reading list and other sources. A tiebreaker is required in which the student must write a short essay dealing with a specified topic about a selected literary passage.